Well summer has officially started and for me that means I start wearing my white jeans. I know that they are now worn by many year round but I like to save mine for the summer season, it’s like getting a new pair of jeans each year! Some people find it challenging to wear white bottoms but really if styled right, anybody can pull it off. Just like blue denim, they can be dressed up or down. My favorite way to wear is with a chambray top and metallic gold sandals, just the right mix of casual and dressy. White and camel neutrals also looks great together and very polished, perfect for work. I’m inspired by the below look with the pop of color, very fun! 23 Jun	This entry was published on June 23, 2014 at 8:00 am. 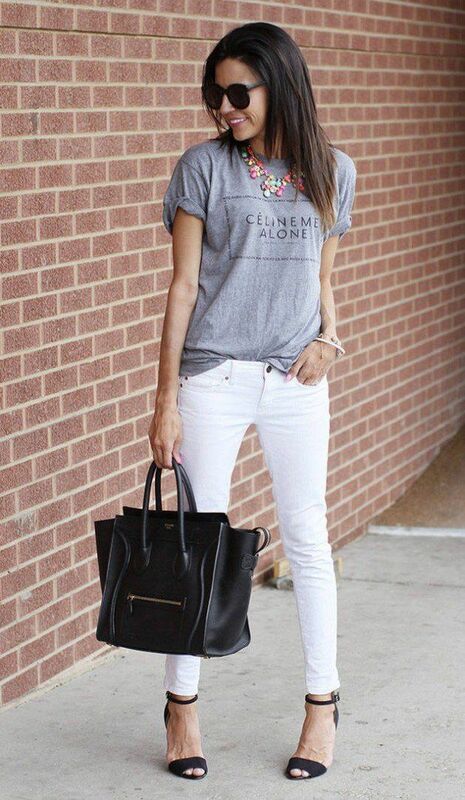 It’s filed under Style and tagged How to wear white jeans, White jeans in summer. Bookmark the permalink. Follow any comments here with the RSS feed for this post.